Disrespected by Megatron one too many times, Starscream decides to turn on the Decepticon leader. He once fought to earn honor in the eyes of the tyrant. Now he will stop at nothing to earn his revenge. Having missed out on the entire Unicron Trilogy (college will do that), I've never had any connections to characters from Armada, Energon, or Cybertron. So when the Generations line went with the 'Thrilling 30' theme, there were bound to be characters from that era that I really wouldn't care about. Along came Starscream (one of my G1 favorites), and while the mold looked really nice, there wasn't any emotional or nostalgic connection for me to jump in. Lo and behold I came to understand that while this version is a recreation of the Armada toy/character, the included comic pegs this Starscream as a repurposed body for Generation 1 Starscream. Color me interested. I took a chance on the purchase, and I have been very happy I did! 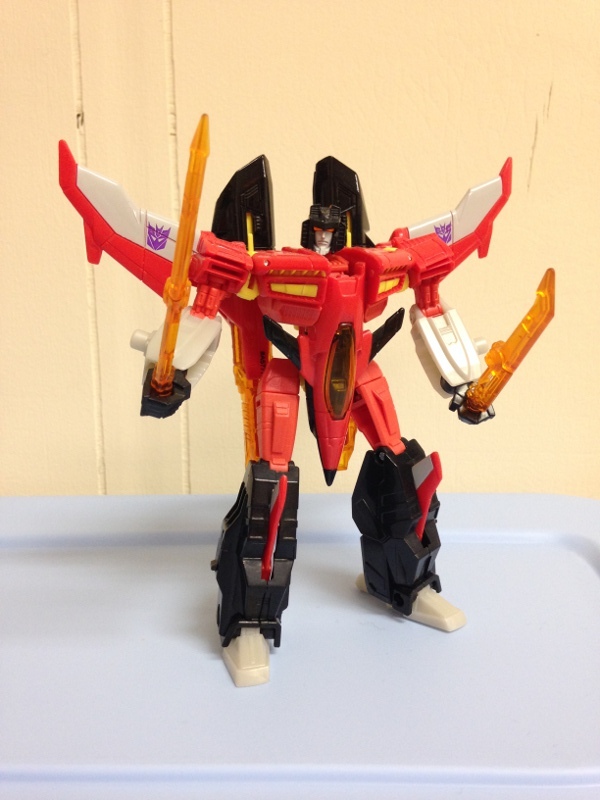 Starscream's alternate mode is a futuristic (Cybertronian?) jet, as is practically every other incarnation of Starscream. To my knowledge, the mode isn't modelled after any real or prototype jet, but it still comes off looking pretty slick. The main features are the backswept wings, small wings on the fuselage, and top engines/missile launchers. 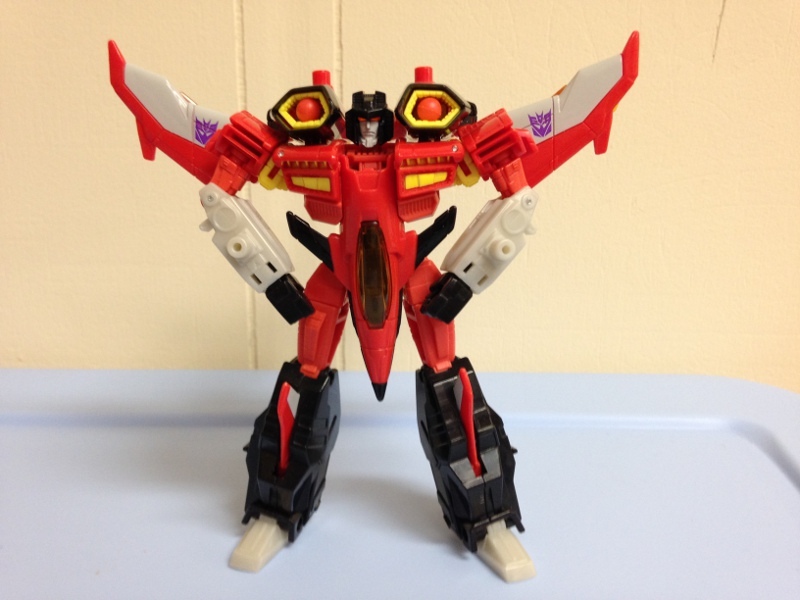 As you can see in the photos, the main colors of the jet are red and black, with some light grey and yellow added in. There are a couple bits of clear orange added in the cockpit and the engines as well. On the underside, things are somewhat well hidden: Starscream's face is obscured by a tiny plate that folds up, and the hands are hidden in the forearms. The legs tuck in as well - basically this isn't like some jet Transformers around that feature a robot tacked on to the bottom of a jet and vice versa. The only problem I have with the aesthetics is the shoulders that are just under the wings. For a jet, they are a huge blocky section that would definitely ruin aerodynamics. It's a small problem that doesn't really detract from the overall feel, but it's there nonetheless. Overall, the jet mode looks sleek and fast. There are a few fun things to do in jet mode: the landing gear flips up and down, the missiles fire via pressure from the back of the engines (not spring loaded - the same mechanism used in Generations Springer's rifle) and there are a couple min-con ports on the top of the jet. While landed, the jet is pretty balanced and doesn't tip in any direction. As an added bonus, Starscream's energon blades fold up and fit snugly under the wings. From the top and front they are barely noticeable. For a simple jet mode, there's a good bit of fun to be had. Starscream looks fantastic in robot mode. The aforementioned colors don't bring anything new in this mode, but they do give a great homage to the namesake figure. In my opinion, this version of Starscream very closely resembles his animation model. The head mold is simply awesome. It has great detail, great range of motion, and the orange light piping is fantastic. The photos I took even caught some of it, and I didn't do anything special to the lighting. There's only a few small problems I have with the looks of the robot mode, and those are mostly hidden. Due to the design, the inner forearms and back of the calves are hollow to allow for the hands and feet respectively to be hidden in jet mode. The arms can be positioned as such to minimize this, and the hollow legs are really only visible from the back - the front is filled in nicely with the rear wings of the jet mode. One other hollow spot is the torso - which you can see only from the side, thankfully. Other spots that could be hollow, like the underarms, are filled in nicely with detailed yellow plastic. It's a small touch, but it makes the otherwise hollow robot feel a little more full. As for fun, Starscream has a lot to offer. 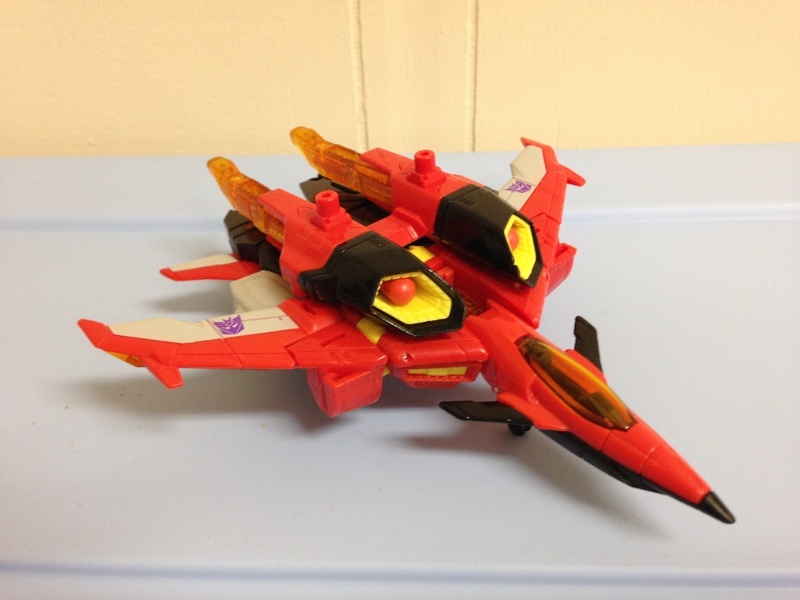 Dual energon blades are a huge leap from the original toy - you had to sacrifice a wing for a sword before. The new blades are made of translucent orange plastic, and can be folded and snapped in to the backside of the wings when not in use. Starscream has a total of four mini-con ports available in robot mode: two on the engines when flipped up, and two on the forearms. If you've been collecting mini-cons over the years, you'll be all set to beef up ol' 'Screamer. Speaking of the engines, I prefer to have them resting on his back, but they can be flipped onto his shoulders for missile deployment, just in case you want to mix your sword fights with a couple missiles to the face. In the articulation and balance departments, Starscream is ace. Joints are everywhere, and none of them are hindered. You can get him into some really awesome positions, and his large feet compensate most weight balances pretty well. His range of movement in his hips/knees and shoulders is really quite impressive. If needed, the wings are also on ball joints, so you can tweak them out of the way a bit to adjust for any weird arm positions. Flipping the engines up on the shoulders does add a little weight to the back (and a lot of depth too since the translucent orange adds about 5 cm back there) which can case some balance issues, but flipped down they do not seem to be a problem. Overall I think Starscream's robot mode is quite solid, well balanced, and boasts some really fun features. Transformation Design: 8. Smooth and simple. It's not intricate by any means, but going back and forth is a breeze. Durability: 7. Starscream is solid, but the Energon blades could snap at the joints. Other thin points could be problematic with extended play. Fun: 9. Well balanced & articulate, Energon blades, mini-con ports, and missiles. Starscream is a ton of fun! Aesthetics: 9. Starscream looks fantastic in both modes. If you look at him from the side though, you're bound to see a hollow torso. Articulation: 9. There are several joints everywhere, none of which are hindered. The balance of the figure with all those joints leads to some interesting positions. Value/Price: 7. I don't like the newer prices for deluxes. $15 is too expensive in my book, but since the whole line has gone up in price, you still get a lot of fun for the money. Overall: 9. I don't think Starscream is a perfect figure, but he's really close. You won't be disappointed at all if you buy him. There's a lot to do with mini-cons, energon blades, and great articulation. He's well balanced and looks great in both modes.